Iiyama"- Little Kyoto" SUBPAGE | All Japan Kyoto Association"
Iiyama in the Kita Shinshu region developed as a castle town. A master of Japanese literature, Toson Shimazaki called it as “A Little Kyoto in the Snowy Region” as many Buddhist temples are scattered around the city. Since Kenshin Uesugi established Iiyama Castle, successive feudal lords continued to develop the town and over 20 temples were also built. 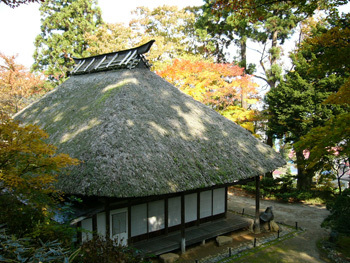 Shoju-an Temple (Historical Site of Nagano Prefecture), Shunshu-ji Temple (a model of Shimazaki’s famous novel, “The Broken Commandment”) and many other historical attractions are connected by a nice walking path. The serene Chikuma River, seasonal flowers and plants, and Iiyama’s historical artifacts all welcome visitors. Iiyama was a setting in the Japanese film “Amidado Dayori” and many film fans visit the city to view the locations for themselves. A famous Buddhist monk, Shoju Rojin had his religious training at this temple. It is designated as a historical site by Nagano Prefecture. Stone monument dedicated to Toson is located in the precinct. One of the best cherry blossom viewing sites in the Kita Shinshu region. Best time will be from around mid-April. Production process of Iiyama Butsudan Buddhist alter and Uchiyama Washi paper is exhibited. Visitors can try making handmade washi paper. The long history and beautiful nature of Iiyama City that people have inherited from their ancestors is introduced. About 100 lovely dolls are exhibited. Exhibit items are changed twice a year in spring and autumn. Snow figures, mikoshi portable shrine parade in the snow, lanterns in the snow and many other events will be held. One of the must-see is the beautiful night illumination. For one month, from the late January to the early March, about 20 snowdomes, large and small, will be created and a variety of events will welcome visitors. The Chikuma River, along with the surrounding mountains still sprinkled with snow and the vibrant yellow color of field mustard flowers create splendid scenery. During the festival a number of shops are opened and many fun events are held. Enjoy the beautiful yellow carpet of field mustard flowers. Over 30 artists will join this art fair held in the Segi accommodation area. A variety of art experiences are available: fabric weaving, handmade washi paper making, picture postcard making, flower pressing, preserved flower collections as well as mini concert performances. Approx. 10,000 hydrangea bushes beautifully adorn the temple approach. The is the best place for hydrangea viewing where hydrangeas start to color latest in the Shinshu area. The view of gorgeous fireworks reflected on the surface of Hokuryu Lake is superb. The Starmine is particularly outstanding and a must-not-miss. Colorful paper lanterns made with Uchiyama Washi handmade paper will adorn the city. One of the best summer attractions around the Chikuma River in Iiyama. Enjoy dynamic fireworks exploding just above your head. Madarao Highland Summer Festival and Firework display are the two major summer annual events of Iiyama. The fireworks are set at a closer distance than in general firework festivals. A number of stalls are opened and the Japanese drum show by a local group will be fun to watch. This is a once-a-year opportunity to enjoy a number of temple treasures in the city. Sales of local specialties and vegetables are also held. Iiyama Flower Festa will be going on at the same time. Accommodations and restaurants in the Madarao Highland area will exhibit art works by artists who live in and outside of Nagano Prefecture. Touch, experience and purchase your favorite art piece in the pleasant atmosphere of Iiyama. As the air of autumn deepens, autumn festivals will be held at many places in the city in which people wish for a good harvest and peace in their family. A festival is held somewhere every weekend in September: Annual festival of Nadachi Shrine, Narasawa Otengu, Gosoku Daidai Kagura, annual festival of Shizuma Shrine. Production of Buddhist altars (butsudan) has been an important traditional craft of Iiyama for over 300 years. The pleasant climate and religious devotion of people in this area made it possible to continue such an excellent craft works up to the present day. Traditional Craft of Japan. Uchiyama paper is a handmade washi paper which is a traditional craft of Iiyama. The only material used for washi is kozo (a kind of plant) whose skin is placed and left on snow so that the finished paper becomes a beautiful white. Traditional Craft of Japan. Also known as Kenshin Tomikura Sushi. Simple yet tasty local food using plenty of blessings from the mountain. Very unique soba noodle made with fibers of Oyama Bokuchi (wild burdock) leaves. One of the carefully brewed sake in the region, “Hokko Masamune,” is made from “Kinmon Nishiki” special sake rice grown in Iiyama. “Mizuo” is another excellent sake from Iiyama which uses natural spring water from Mt. Mizuo. Experienced sake production masters (Iiyama Toji or Kurabito) take their upmost care in its production. The advanced feeding technique and special blending of the feed crop are two major secrets of this tasty branded pork. The meat is firm yet has a natural sweetness and rich taste.